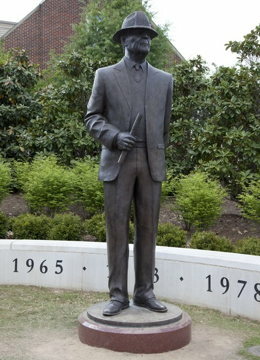 Legendary football coach Paul “Bear” Bryant once explained that his coaching philosophy involved communicating three things to his players: “If anything goes bad, then I did it. If anything goes semi good, then we did it. If anything goes real good, then you did it.” According to Bryant, that was all it took to get people to win football games for you. At the root of that philosophy is the idea of encouragement. Bryant’s philosophy celebrated the times when people got things right rather than harping on the things they got wrong. It fostered an attitude that his players could succeed. Sometimes, that’s all people need. Encouragement is a necessity not just in the realm of athletics but in every part of life. Businesses, families, classrooms, governmental bodies, and churches all thrive on encouragement. When there are plenty of encouragers around, almost anything can turn out successfully. When things are heading in the wrong direction, a positive, vocal, and fiercely loyal encourager can turn the situation around. Today’s text describes Paul’s longing to be reunited with the Thessalonians. Paul intimates that his sufferings for the sake of the gospel have kept them apart. He didn’t want them to be discouraged by his problems. At the same time, he rejoices that the Thessalonians have been “standing [their] ground” (3:8) in the face of their own unnamed difficulties. Given these difficult circumstances, Paul sent Timothy to encourage the Thessalonians in their faithfulness. We don’t know precisely how Timothy performed this ministry, but we know it worked! He was later able to report back to Paul about the Thessalonians’ faithfulness and love—and that proved an encouragement to Paul and those with him. Richard Grimes, “Be Encouraging to Others,” Albia Newspapers, 19 Aug 2016 http://www.albianews.com/opinion/article_ab0447be-661a-11e6-bb76-0f09478411a6.html. • When have circumstances threatened to shake your faith? How did you respond? Who was there to encourage you? • What seems to work best in giving you encouragement: a spoken word, a card or letter, an evening away to do something fun? • What biblical stories or passages have encouraged you in difficult times? • Whom do you know who might need your act of encouragement? One of the best-known associates of Paul, often mentioned in the NT as Paul’s faithful and trusted fellow worker. In several of Paul’s Letters (2 Corinthians, Philippians, Colossians, 1 and 2 Thessalonians) Timothy shares the opening greeting to churches. He belongs to a very small group of early missionaries and often shares in the very essence of Pauline preaching (2 Cor 1:19). At least in one instance, Paul intimates that Timothy should be ranked among the apostles (1 Thess 2:6). He may have been a convert of Paul, who refers to Timothy as a faithful and beloved child in the Lord (1 Cor 4:17; 1 Tim 1:2; 2 Tim 1:2)…. Timothy’s duties were not limited to accompanying Paul in his missionary journeys. Very often, alone or in the company of others, he served as Paul’s emissary to churches. At Beroea, Silas and Timothy were left behind to continue Paul’s work (Acts 17:14). Timothy and Erastus were sent to Macedonia by Paul (Acts 19:22). When the church in Thessalonica went through unbearable tribulations, Paul sent Timothy to exhort them and bring back the good news of their strong faith (1 Thess 3:2-6). On several occasions he also shared Paul’s ministry at Ephesus. Paul Ciholas, “Timothy,” Mercer Dictionary of the Bible, ed. Watson E. Mills et al. (Macon GA: Mercer University Press, 1990), 920. Paul reminds them that he has been telling them over and over again that they were going to be persecuted (3:4). The verb proelegomen, translated as “we kept telling,” is in the imperfect tense, with iterative force, literally rendered in this manner, “we kept on warning you over and over again….” Paul quotes his own words, spoken on several occasions before the appearance of these written words to the believers. The use of hoti in v. 4 introduces a quotation in the Greek text, which features Paul’s own words: “For even while we were with you, we kept on telling you [hoti], ‘We are going to be persecuted,’ just as also you know that it came to pass” (3:4). Paul has been warning the believers that persecution would be inevitable. Suffering, from whatever source with whatever manifestation, is inevitable in Paul’s mind. It is going to happen. It did happen, as in Paul’s testimony. It will happen, as indicated by Paul’s admonition to the young believers. The young believers may experience physical abuse, as Paul did when visiting their city. The young believers may also experience the emotional discomfort when neighbors do not agree, when a minority group determines to break with the herd, when one group establishes norm and values apart from the established group. In some ways, these internal places of discomfort may even be more troubling than serving jail sentences or enduring public flogging. With whatever anxiety that may be unfolding, Paul writes the believers to remind them that they are not alone. Paul’s letter continues to sustain them in the time of crisis. In addition, Paul’s dear colleague, Timothy, comes to stand beside them in their agitation and pain. Linda McKinnish Bridges, 1 & 2 Thessalonians, Smyth & Helwys Bible Commentary (Macon GA: Smyth & Helwys, 2008), 80–81.